Reports in Belgium suggest Burnley have made an offer for Anderlecht midfielder Steven Defour. 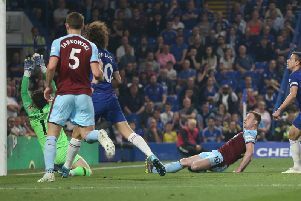 But the 28-year-old, who has 46 caps for Belgium, is not thought to want a move to Turf Moor, despite being unhappy at the Constant Vanden Stock Stadium. Southampton are also keen on Defour, as well as UAE club Al-Jaraira. Defour's agent Paul Stefani said: "Anderlecht's board knows Steven is unhappy, so if an interesting offer comes in we are ready to talk. "He has been insulted and had beer thrown at him by Anderlecht fans, and he did not like that at all. He always gives his best, and thought things would be different. "A number of clubs have enquired about Steven's situation." Burnley are desperately trying to bolster their midfield options, having had three offers each for Derby County's Jeff Hendrick and Brighton's Dale Stephens turned down. The club also lost out to Championship side Norwich City for the services of Spurs wideman Alex Pritchard.